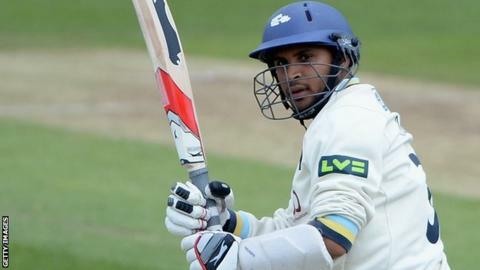 Adil Rashid completed a century as Yorkshire had the better of day two against Somerset at Taunton. Resuming on 84 not out, with the visitors on 342-5, Rashid reached 108 before being caught behind off the bowling of Craig Overton (3-72). Andy Hodd made 55 before Yorkshire were eventually all out for 450. Chris Jones led the Somerset reply, compiling 75 prior to falling to Liam Plunkett, while Nick Compton made 32 as the hosts closed on 166-3, 284 behind. Compton, 30, who will be hoping to earn a recall to the England Test side, had to dig in for his first County Championship innings of the season, which included just one boundary off 89 deliveries. But the day belonged to Rashid, whose 108, which came off 190 balls and included 18 fours, helped Yorkshire towards maximum batting points and a commanding position in the match. Somerset's reply actually got off to a steady start, with Marcus Trescothick and Jones seeing off the first 10 overs to reach 36-0. And, after Ryan Sidebottom bowled Trescothick for 20, Jones and Compton combined to share 91 for the second wicket, before Plunkett (2-48) intervened to dismiss both batsmen within six overs of each other to leave the hosts in a tricky position. "As England attempt to salvage some pride out of their miserable winter, could they turn to Adil Rashid of Yorkshire? "They know from the past about his leg-spin abilities, but now he has emerged as a top-class batsmen. "There was evidence of that last season and he has started well in this match with a wonderful 108. "A word of praise for Somerset youngster Chris Jones. He played really well for his 75 and if others can show similar resolve, then Somerset might pull off the draw."